I was browsing Pinterest looking for Mood Board ideas when I found this amazing lady who makes all her own Mood Boards. 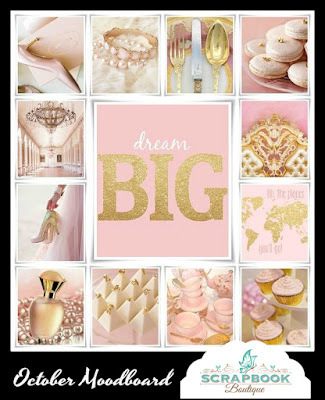 Her name is Audrey T. I contacted her & she has kindly allowed us to share her mood boards for our monthly challenges! Challenge : Create a project using the mood board as your inspiration. One randomly chosen winner will win a $30 Store Credit. Challenge Closes : Midnight 30th October 2017. To be eligible to enter the Blog Hop Prize Draw you must leave a comment on all five of the Designer Gal's Blogs & then come back & leave a comment on this post where we will choose a randomly drawn winner. A quick question.. Can I participate in the challenge and blog hop if I have a friend in Aus/NZ? I believe it is to do with shipping charges on winning? Please clarify..
Another fab hop with goregous creations from the DT. Love the colour combo of this mood board - with birthday time almost upon me this should be some great inspiration and motivation. That's a great mood board ! Fabulous mood board and fabulous design team inspiration!! Thanks for the challenge. I've added my entry. Have uploaded my entry for October moodboard challenge...love pink and gold.